Shakespeare's Religious Allusiveness complicates debates about whether Shakespeare's plays are fundamentally Protestant or Catholic in sympathy, challenging analyses that either find Protestant elements consistently undercutting Catholic motifs or, less often, discover evidence of the playwright's endorsement of Catholic doctrine and customs. 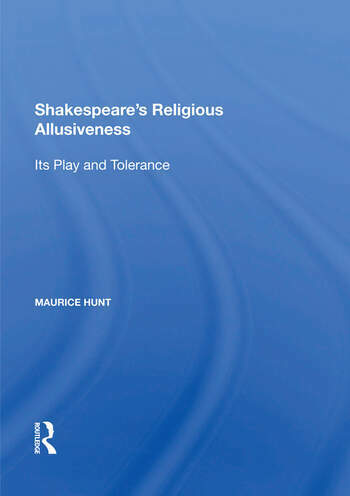 Rather, Maurice Hunt argues that Shakespeare's syncretistic method of incorporating both Protestant and Catholic elements into his plays was singular among early modern English playwrights at a time when governmental and social tolerance of Protestantism in the theatre was high and criticism of stereotyped Catholicism was correspondingly rampant in drama. In-depth discussions of The Two Gentlemen of Verona, the Second Henriad, All's Well That Ends Well, Twelfth Night, and Othello reveal how Shakespeare allusively integrates Reformation Protestant and Roman Catholic motifs and systems of thought. This book sheds new light on the playwright's knowledge of and interest in Elizabethan and Jacobean religious debates over the nature of spiritual reformation, the efficacy of merit for redemption, and the operation of Providence. It will appeal not only to Shakespeare scholars but to those interested in the cultural history of the Reformation. Contents: Preface; Catholicism, Protestant Reformation, and The Two Gentlemen of Verona; The hybrid reformations of Shakespeare's second Henriad; Helena and the reformation problem of merit in All's Well That Ends Well; Malvolio, Viola, and the question of instrumentality: defining providence in Twelfth Night; Predestination and the heresy of merit in Othello; Coda; Bibliography; Index.